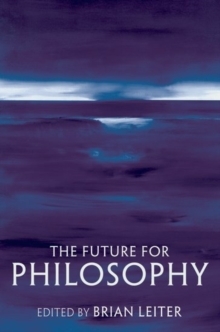 Where does philosophy, the oldest academic subject, stand at the beginning of the new millennium? This remarkable volume brings together leading figures from most major branches of the discipline to offer answers. What remains of the 'linguistic turn' in twentieth-century philosophy? How should moral philosophy respond to and incorporate developments in empirical psychology? Where might Continental and Anglophone feminist theory profitably interact? How has our understanding of ancient philosophy been affected by the emergence of analytic philosophy? Where does the mind-body problem stand today? What role must value judgments play in science? Do Marx, Nietzsche, or Freud matter in the 21st century? These and many other questions at the cutting edge of the discipline are addressed by distinguished philosophers from Australia, Britain, Canada, and the United States. They aim not only to stimulate philosophical debate, but to introduce those in cognate disciplines--biology, classics, economics, history, law, linguistics, literary studies, mathematics, philosophy, physics, political science, psychology, among others-- to what is happening in contemporary philosophy. In a substantialintroduction, the editor gives an overview of the state of philosophy today and helps orient non-philosophers.